What a cool concept: Chikara meets Champions of the Galaxy with UltraMantis Black suddenly appearing in the future in the GWF during the incredible Black Death era! 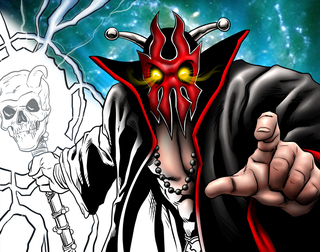 UltraMantis Black has an awesome new playing card but why is he holding a Black Death skull staff? Is he trying to join Black Death or will he side with the GWF against the evil takeover? It's up to you, promoter! A very rare and collectible card!